“15 Step” was premiered on May 6, 2006 in Copenhagen, Denmark. 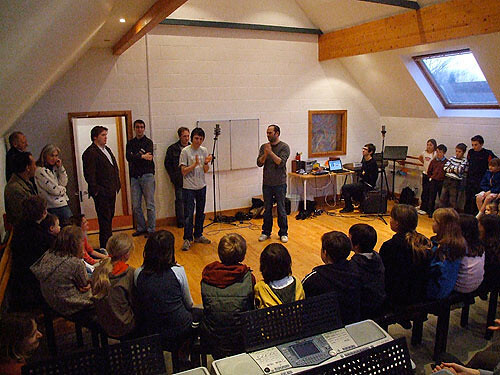 Colin Greenwood and Nigel Godrich at Matrix Music School in March 2007 instructing children on handclaps and yelling “Yeah!” for “15 Step.” See more photos here. One suggestion for the meaning of the title is that the majority of popular songs are written in or 4/4 or less frequently 3/4, which would require a 12 or 16 step to stay in time when dancing. However, somebody dancing to a song with a 5/4 time signature could confidently stay in time with a 15 step dance. Another possibility is it refers to the 15 steps of the Courtyard of the Temple in Jerusalem, on which the Levites stood and sang the 15 Songs of Ascent (Psalms 120-134) during the offering of sacrifices. Radiohead performed this song at the Grammy Awards in 2009, where In Rainbows won for Best Alternative Album – Radiohead’s third win in that category. They were introduced at the ceremony by Gwyneth Paltrow, and were joined by the USC Marching Band.